Golden Chanterelles. Edible Mushrooms in Southeast Alaska. A mushroom knife with a brush is helpful when harvesting golden chanterelles or any mushrooms. These small, young chanterelles were harvested early in the season. Bringing tasty edible mushrooms home to add to meals is a bonus in any day. I so enjoy finding the golden chanterelle and the winter chanterelle! My favorite of the two is the golden chanterelle. There are several closely related species that are called golden chanterelle, and all of them are edible and tasty. The Cantharellus formosus or Pacific golden chanterelle, Cantharellus cascadensis, and Cantharellus cibarius are very similar in appearance. Here in Southeast Alaska I have found enough abundance in some years to have some fine meals, and to put some chanterelles up for winter. In other years I have felt lucky to find just a few. I have never encountered enough to think about a commercial harvest. The photos that I see from other places of golden chanterelles dotting the forest floor astound me. Hunting golden chanterelles here in the Tongass National Forest is usually a strenuous day of climbing and crawling, resulting in a few bruises, and two or three pounds of golden chanterelles if I am lucky. There are several dangerous look-alikes, so know your chanterelles if you plan to go harvesting them. More about that in a bit. Finding one golden chanterelle peeking out from under moss or finding a herd of them hiding under a tree root is pretty common. Golden chanterelles in a hollow under a tree root. Sometimes, though, chanterelles are standing out boldly on the forest floor. Chanterelles have vein-like ridges instead of blade-like gills. The buff tan to golden yellow is the first thing to draw my eye. Young golden chanterelles have a firm cap with the edges of the cap rolled under. With age the edges become thinner, fluted and soft. The stalk flows into the cap like a trumpet. Golden chanterelles have vein-like ridges instead of blade-like gills. The ridges extend partway down the stalk and cross link and branch. I turn every chanterelle over to look at the ridges and be sure that it is a chanterelle. The spores are white, yellowish, or ochre. There are several look-alikes that could make you very sick! The false chanterelle is a cheery bit of chanterelle-like color. Sometimes it even has pretty, wavy edges like a chanterelle. It is a flimsy mushroom, though, so your hands will tell you something is not right. If you turn it over you will see that it is too orange on the underside. Then you will notice that it has gills instead of ridges, and does not belong in your mushroom basket. The jack-o-lantern mushroom could also be mistaken for a chanterelle. Check every chanterelle that you pick, and if you are not sure, don’t eat it. False chanterelles can look similar to golden chanterelles, but don't eat them. 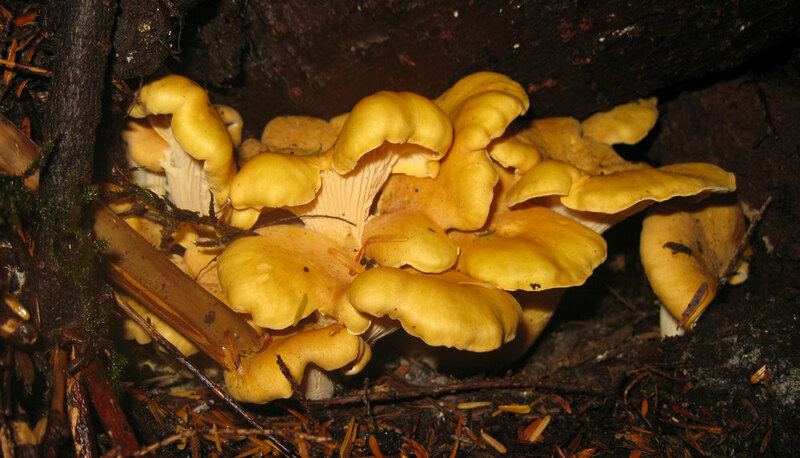 The underside of a false chanterelle is very different from a golden chanterelle. Some golden chanterelles are pretty round, and others are...artistic. Having found golden chanterelles in old growth, second growth, beside driveways, on hills, in valleys, near streams, and away from water sources, I hesitate to tell you to look in a certain type of habitat. If you find a patch then there are likely to be more in the general vicinity the next year. Golden chanterelles pull apart like string cheese. If I don’t feel like slicing them, or want a different presentation (yeah, right, like I am a fancy enough cook to pre-think presentation) then I pull them apart into strips. The delicate deliciousness of golden chanterelles is a favorite in cream of chanterelle soup and in omelets. Once, when I was living semi-remote, I discovered that there was no cream, half-and-half, or milk in the cabin to make cream of chanterelle soup with - imagine! There was sour cream, though, so I cobbled together a sour-cream-of-chanterelle soup, and it was scrumptious. If it hasn’t been raining then chanterelles are pretty easy to clean. Trim the stalk and brush them off in the field, then wipe them with a damp cloth or paper towel, if needed, before cooking. If the Southeast Alaska rain has been pummeling the mushrooms, and splattering forest duff onto them, then more drastic measures must be taken. Try not to immerse chanterelles in a bowl of water, as they soak it up like a sponge and then get mushy when cooked. I use a natural bristle brush and a little water to banish the dirt and spruce needles, and then shake or pat them dry. Well, sort of dry. For most purposes I slice chanterelles and sauté them with butter. 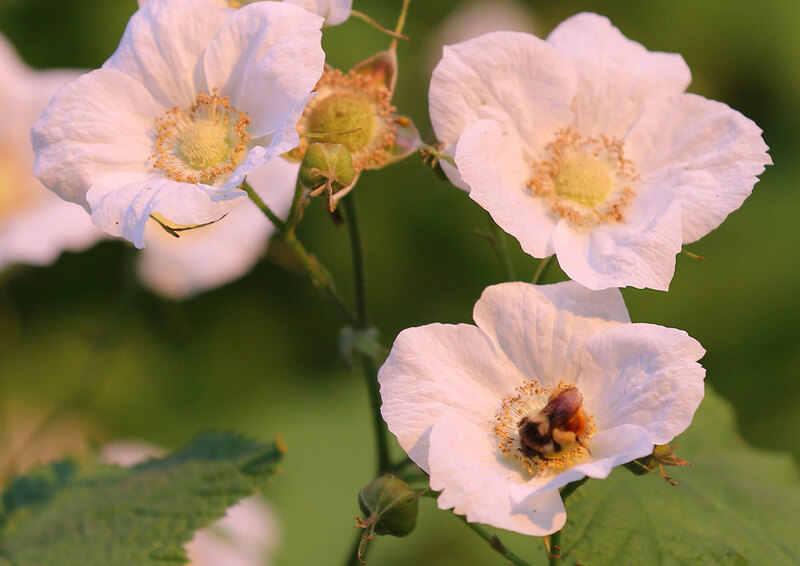 They make moisture – quite a lot of it if it has been raining. You can cook them until the liquid is gone, or pour it off if it threatens to drown your work. Golden chanterelles are a splash of color in the forest. I preserve mushrooms for winter by freezing them. Label a Ziploc freezer bag with contents and date first. Put half a cup to a cup of sauteed mushrooms into a Ziploc with a little of the liquid from cooking. Press out all of the air, and roll the bag up, seal, and freeze. Easy!